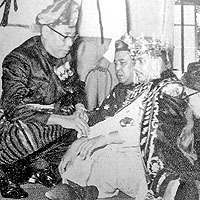 BRUNEI TOWN, August 19, 1961 - Installed as Crown Prince this week, the Sultan's eldest son said that with the will of Allah, he would do the duties demanded of him to be the best of his ability. The ceremonial rituals at Istana Darul-Hana were traditional and colourful. The solemnity of the occasion was tempered by the bright splash of court colours and the rich gowns worn by officials and onlookers alike. The prince wore a headdress of beaded jewels during the ceremony earlier this week. After the proclamation had been read out by Dato Setia Marsal, the Deputy Menteri Besar, the Pengiran Bendahara presented the 15-year-old prince with the Royal Kris. A special feature of the guard of honour was the inclusion of school children. Wearing floral crowns, girls in neat white and green baju kurongs, walked beside the stately palace guards and spear bearers who were garbed in either total red or total black. KUALA LUMPUR, SEPTEMBER 30, 1961- Eight months have passed since the Sultan of Brunei sent his two sons to one of Malaya's best secondary schools, the Victoria Institution in Kuala Lumpur. It has been an interesting period, not only for the two princes, but also for their principal, Dr G E D Lewis, their teachers and Malayan schoolm-ates. 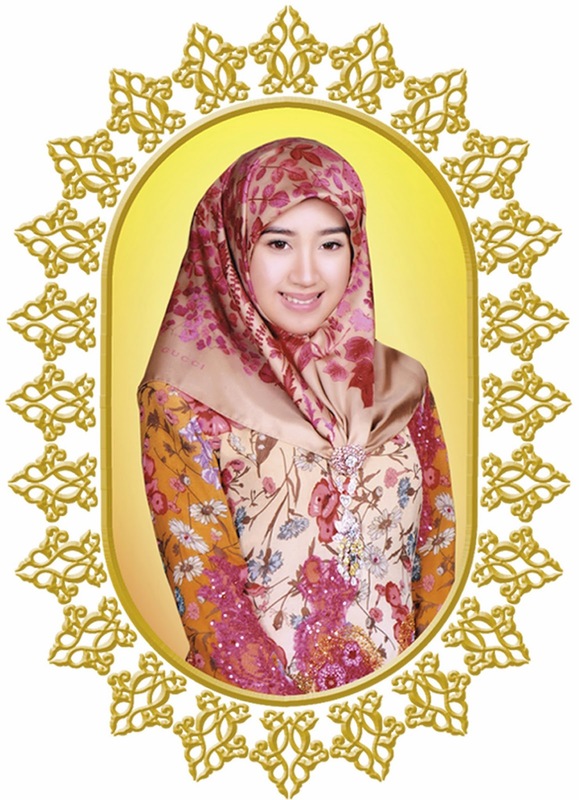 It constitutes a transition from their previous palace cloistered education by tutors in Brunei to studying in a public school - fitting them into an entirely different life. Except for the occasional glimpses, the public have never before known how the two princes - Pengiran Muda Hassanal Bolkiah, 15, and Pengiran Muda Mohamed Bolkiah, 14 - fared in the school. This is the first full report of their schooling here based on interviews with Dr Lewis, Pengiran Muda Hassanal Bolkiah's form teacher, Mr Yap Chai Seng, Pengiran Muda Mohamed Bolkiah's teacher, Mr T Rajaratnam and pupils of the school. Perhaps the best indication of their progress is the remark made by Dr Lewis that the two princes "are holding their own among a highly selective group of pupils". The Victoria Institution has always drawn the cream of Malayan schoolboys and to say they are holding their own among the pupils of Form One in the school, where the medium of instruction is English, is praise indeed. Their form teachers report that Pengiran Muda Hassanal Bolkiah's best subjects are Malay and Art, while Pengiran Muda Mohamed Bolkiah's are Malay and Mathematics. Both the princes are hardworking, keen and well behaved. Mr Yap said: "Pengiran Muda Hassanal Bolkiah often volunteers whenever there is anything to do in class. It may be anything - shifting desks or cleaning up the classroom - and he will always offer to lend a hand. Incidentally, he is the biggest boy in the class and one of the toughest, but at the same time, one of the best mannered and gentlest boys." 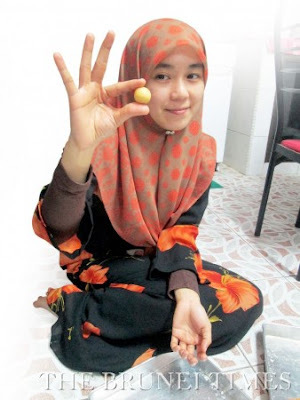 Pengiran Muda Hassanal Bolkiah's generosity is also well-known to his classmates and teacher. Mr Yap said that Pengiran Muda Hassanal Bolkiah once contributed $100 of his own savings to the school's appeal fund for sports day. Both rather kept to thems-elves when they joined the school in January this year, but they now mix freely with the Chinese, Indian and Malay boys in the school irrespective of whether they are ambassador's children or boys from poor homes. Dr Lewis recalled that before sending his two sons to the school, the Sultan of Brunei who was then in Malaya invited him to tea and told him that he would like them to receive exactly the same treatment as the other boys.